On Saturday, February 11, we arrived at Montevideo, Uruguay. It is much smaller than Buenos Aires, but still a big city at about 1.8 million people (including suburbs). It had a much more relaxed and friendly ambiance than Buenos Aires (of course, it was a weekend, but still . . .), and we liked it very much. We were supposed to arrive at 8:00 AM. Since Montevideo is just about 150 miles down the Rio Plata from Buenos Aires you would think we would have no trouble arriving on time. But you would be wrong. Because of the problems with the river traffic I explained yesterday we didn’t arrive until noon. But we still had plenty of time to explore this city on foot before the ship left that evening. Montevideo is a very walkable city (at least the old town & the main part of the new town, where we went). Leaving the ship, we passed the anchor from the Graf Spee, a German warship sunk in the harbor here in 1939 in an incident that was famous at the time. It seems the ship was chased into this harbor by several British ships. Uruguay was neutral, and the rules were that ships of belligerents could only stay 3 days, so the British ships just waited outside the harbor for the Graf Spee to come out. Instead the captain scuttled the ship in the harbor, where it still resides (they say you can see the top if its conning tower above the water if you go close enough), and the captain committed suicide rather than being sent back to face Hitler’s wrath. It’s still a big deal around here. Just outside the harbor area is the Mercado de Puerto, an open air craft & souvenir market next to a very large warehouse type building housing a plethora of open restaurants. Even on Saturday it was bustling. We walked through several streets & plazas up the hill from the harbor (Montevideo means something like Mountain View, although you would hardly call this gentle hill a mountain). The streets of Montevideo are interesting, with old & new buildings interspersed. The streets were pretty quiet on Saturday, presumably they are more crowded on business days but nothing like Buenos Aires I am sure. At Plaza Constitucion there was a Saturday flea market being held. It is a very pleasant tree covered square, with an elaborate marble fountain in the middle (commemorating the establishment of the city’s water system) and a number of interesting buildings and the Catedral Matriz around the perimeter. At the flea market they were selling everything from antique cameras & cameos to old victrolas & glassware. We walked on to the much larger & more impressive Plaza Independencia, which is essentially the center of the city. To get there we walked along a pedestrian-only street with vendor stalls and through a gate which is a restoration of one of the original gates to the city. Plaza Independencia was surrounded by interesting buildings. The Palacio Salvo, with its bizarre tower section, is the tallest building in Uruguay and was the tallest in South America when it was built in the 1920’s (you can see it on the right in the city skyline at the top of this blog entry). The Palacio Estavez was the center of government until 1985. And the lovely Teatro Solis, the opera house, is on a corner of the Plaza called (at least on our map; we couldn’t find any sign at the site) “Plaza Golda Meir.” I’m not sure what Golda Meir might have had to do with Uruguay, but there it is. 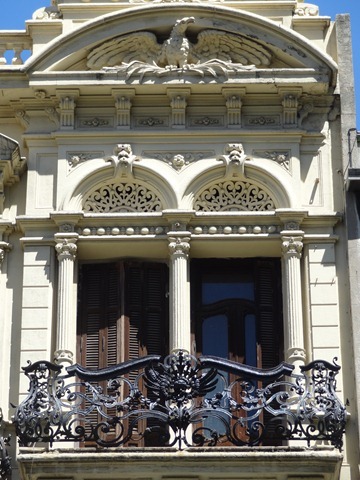 One of the biggest pleasures of exploring Montevideo is the beautiful old architecture you find all over, often mixed in with more modern or even pedestrian buildings. Below is a selection of some of the architectural details on the buildings, which includes a variety of sculpture, balconies, mosaic decorations and old ornate buildings reflected in a modern glass building (a photographic cliche, I know, but still pretty). And so, as the sun sinks slowly in the west, we bid a fond farewell to beautiful Montevideo. Last night was the Valentine’s Day Ball aboard Prinsendam (even though it was February 12, which ought to have involved Lincoln’s birthday instead). I have no pictures of the Ball (Cinderella didn’t make it this time) but below I have included the latest towel animals. As I write this, we will be arriving in Rio de Janeiro early (6:30 AM) tomorrow morning for a two day stay, then two days in small resort towns with little to do but look at the sand & sky & sun (assuming the sun is actually out) so it may be a few more days before there is another posting. And happy birthday to Linda, if you are still following this.